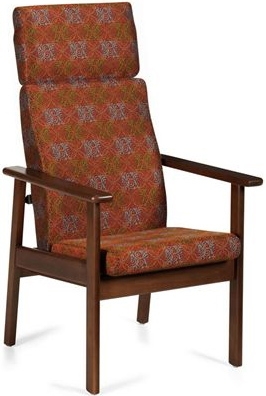 GlobalCARE's Wellness Series waiting room chair offers a unique and practical solution when you want the maximum comfort of a high back chair. It features arms with a grip extension to assist in entering and exiting the chair. The seat and back cushion are constructed using ultracell foam with a waterfall seat front and a hardwood frame. Perfect for a medical office lobby, waiting or patient room. The back cushion offers both a concave and convex curve shaping providing extreme comfort as it is constructed from moulded foam. The seat and back opening enables the chair to be properly maintained and cleaned. The arms offer a grip extension to assist in entering and exiting the chair. Lower leg bracing provides strength and stability to the frame. The seat and back cushion is fully encased by the upholstery with a nylon zippered opening, to prevent the interior construction from contact with spills, body fluids and other elements that would effect the products performance. The seat and back cushion is constructed using ultracell foam with a waterfall front further enhancing the level of comfort. The seat cover has a seamless front to prevent eventual breakdown of seams causing liquid penetration into foam. Hardwood frames are joined using mortise and tendon joints. Allow a 4-6 week lead time.